I get my love of lip balms from my dad. He always has an original Chapstick in his left pants pocket (along with a nail clipper. He keeps change and guitar picks on the right side) and when I was very young, I’d always ask to put a little on. When I five, he gave me my own tube in cherry flavor. It was my first lip balm but certainly wasn’t the last. These days, I have tubes stationed strategically around my apartment and tucked into my favorite bags and coat pockets. I pick them up when I travel as useful, inexpensive souvenirs and remember the places I’ve been with each application. My sister and I also have a habit of buying new lip balms for one another when on vacation and it’s a fun way to share our trips with one another. 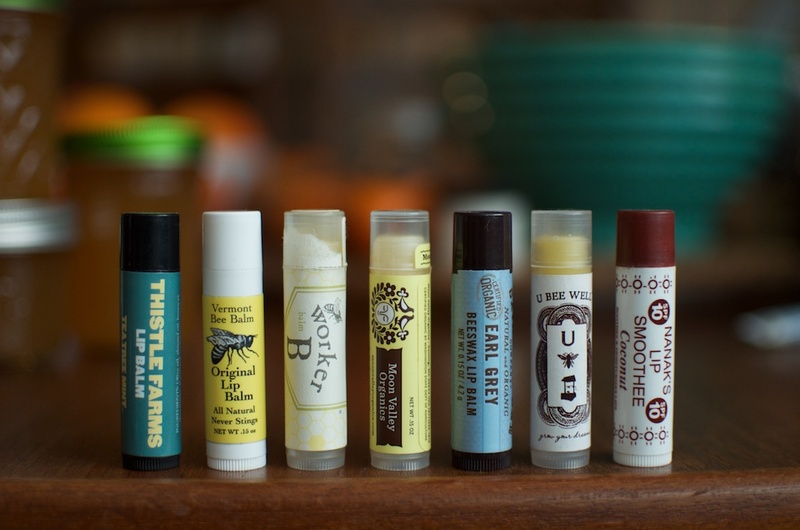 While I love a simple tube of lip balm best of all, for the purposes of this blog, all balms, salves, butters, and general-purpose unguents are fair game. I tend to gravitate towards those made with natural ingredients and scented with either lavender, mint, or vanilla, but you’ll see all kinds here. Marisa is a food blogger, canning teacher, and cookbook author who is most often found over at Food in Jars. She’s written Food in Jars and Preserving by the Pint, and is currently hard at work on her third book, tentatively titled Preserving with Natural Sweeteners (but we shall see). She lives in Philadelphia with her husband Scott, in apartment that is filled to bursting with cookware, canning jars, and yes, lip balm. I got my love of lip balm the exact same way. You will never catch my dad leaving the house without regular Chapstick in his left pocket! Do you ever make your own lip balm? I do (so easy! ), but I would love to read some new recipes. I’ve not made my own balm before, but I would very much like to do it someday. Have you discovered this delightful balm? I have used an entire grapefruit and am using a second. I love the coconut and earl grey. I see a licorice in my future. I love my Worker Bee, but Hurraw is usually in my pocket. And every handbag. Nice flavor, but not sweet, so doesn’t leave you licking your lips. I have not tried it, but I will add it to my list! Mandy! I was in Washington, DC last weekend and found Hurraw in a natural foods store there. I bought it in vanilla and almond and am here to report that they are both entirely delightful. Thanks so much for the suggestion!